I’ve never made one before in my life. Amidst the chaos of our current house construction, and then fleeing to avoid said construction, only to return to a complete unfinished project because we are still ripping down walls (and when I say ‘we’ I mean ‘they’ because I have absolutely nothing to do with it) I’ve managed to bake 3 bundt cakes in the past week. Call it stress relief and my new coping mechanism. This was my first attempt at a bundt cake. I wanted to go classic, topped with powdered sugar or maybe an icy glaze. I played around with the ingredients until the texture and sweetness was to my liking, somewhere in between a poundcake and birthday cake. Cream the butter, sugar, and eggs until pale yellow and fluffy. This is standard recipe jargon but very important. 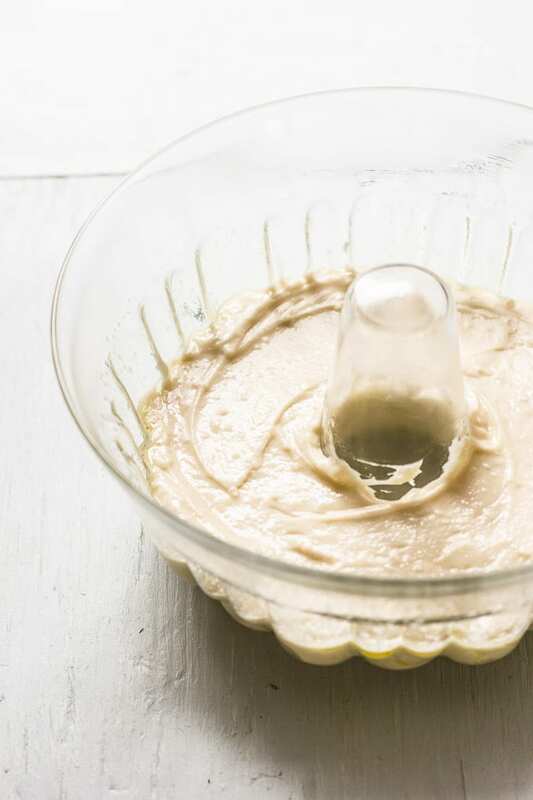 It’s the method by which air is incorporated into the batter giving the cake a nice even rise. Everything should be at room temperature for best results. Use self rising flour. This variety includes baking powder, baking soda and salt already mixed in. It’s made with low protein flour which attributes to a classic fluffy texture, different than regular all purpose flour. Self rising flour is not common in American baking recipes but can easily be found in most grocery stores. King Arthur makes a good one. Now for the scary part- baking. You can’t line a bundt pan! The one (and only) pan I have is glass. I was convinced it would break. Or the cake would stick. But it can go up to 500+ F and needs only a generous coating of cooking spray. I made it 3 times and never had a problem with it sticking. Gone are the days of greasing and flouring the pan. Yippee! To finish, I drizzled a glaze over the top following the natural lines of the cake. The inside was soft, and there was a lovely vanilla scented sweetness throughout. I took a step back to assess my newly baked project and realized it was a giant French cruller (hence the name). It almost looks like an adult made it. I’m no longer afraid of the bundt. It’s as simple as pouring a fluffy batter into a decorative mold and baking to sweet perfection. It’s fancy enough for entertaining yet casual enough to enjoy with coffee or tea. 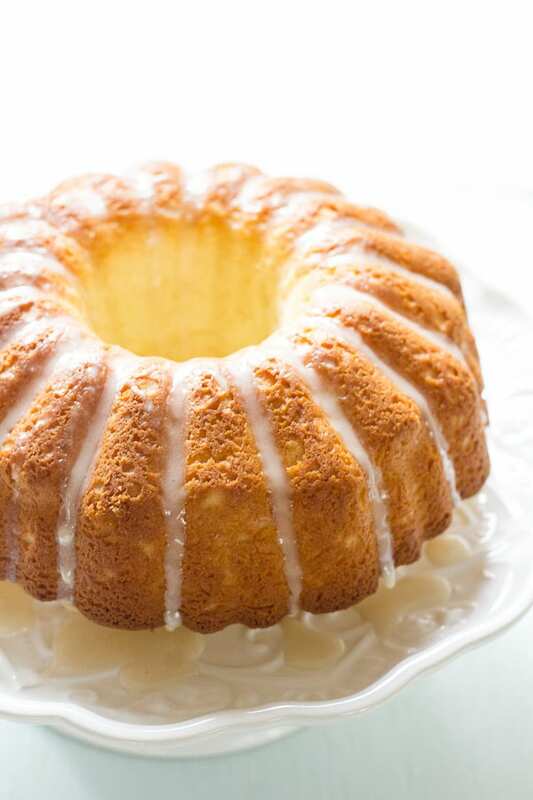 Spray your bundt pan with cooking spray or butter and flour the pan to prevent sticking. If your butter is not soft, microwave for 10-20 seconds. In a large bowl, cream the softened butter and sugar until fluffy, about 2-3 minutes. Use an electric hand held or stand mixer. Add the eggs, one at a time, mixing for about 1 minute after each addition. Add the oil and vanilla extract. Working directly over the bowl, sift the flour into the wet ingredients. Add the buttermilk and mix gently on low speed until incorporated. Do not over mix; the cake will be tough. Pour the batter into the prepared pan using a rubber spatula to spread out the mixture. Bake in the center of the oven for about 30-35 minutes, or until a toothpick comes out clean when inserted. Cool for 10 minutes and then remove from the pan. Transfer to a wire rack. 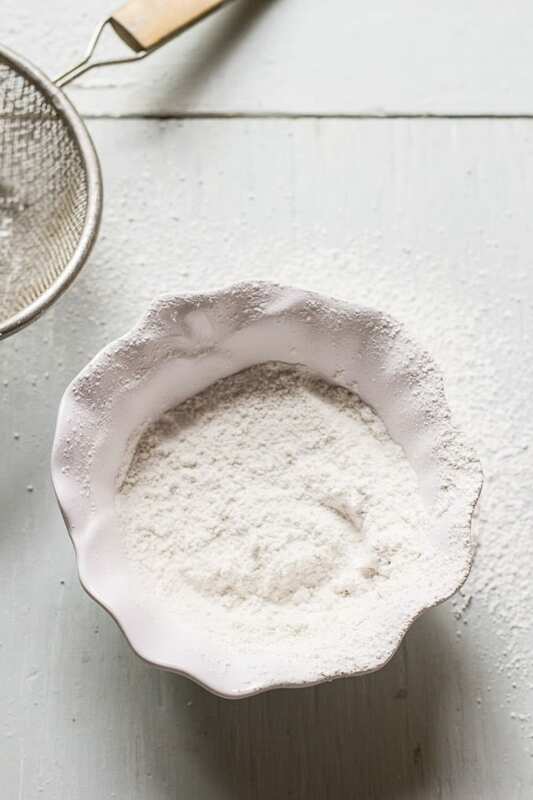 To make the glaze, sift the powdered sugar into a bowl. Add the milk, 1 tablespoon at a time until you have a consistency that's not too thick or thin. Drizzle over the cake while it's still warm. This is seriously the most gorgeous cake I’ve seen in ages! Pinned! The lighting and your photography, as always, is just stunning! My fave thing to bake is….non-fussy, uncomplicated things that I know will always turn out and everyone loves. Cookies, blondies, easy cakes, brownies! I love baking fresh bread for my family or for dinner parties. I enjoy trying new recipes and adding in different ingredients each time I bake a new batch! I would love to learn how to make homemade bagels. You are speaking my language girl! I lOVE to bake bread. What do you like to make? I do a lot of sourdough loaves and a lightened up brioche shaped into rolls and sandwich bread. I’ve never tried bagels before. If you find a good recipe let me know! 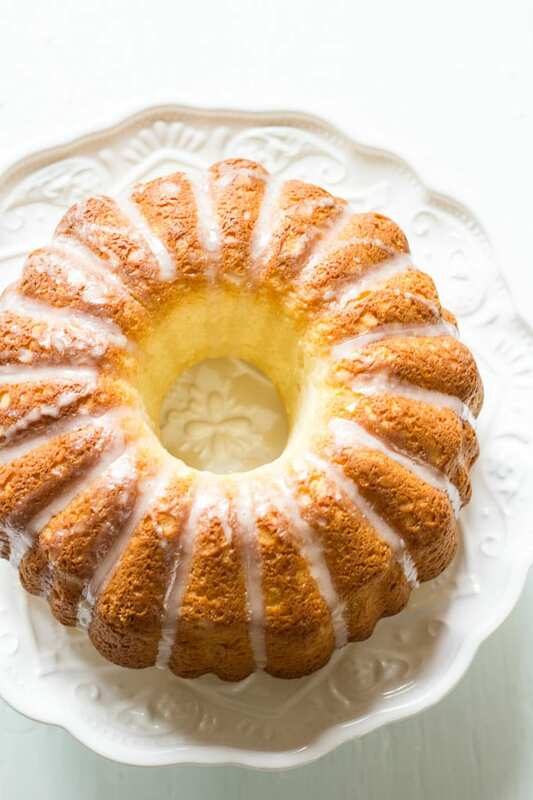 Your bundt cake is really beautiful, you did such an amazing job with the recipe! I’ve never used self rising flour, sounds interesting… And it was funny to read your article as well :) Unfortunately I guess I can’t tale part in the giveaway since I don’t live in the US but I wish good luck to the happy winner! Have a lovely day and congrats again on your French masterpiece! Bonjour darling :) Thank you very much for your sweet words and wishing luck to our winner! Self rising flour is very interesting to work with, in my opinion, mainly because of its low protein content. It really does change the texture of anything you make giving it a light and fluffy quality. My mother-in-law uses it often. That’s how I got into it. I use it for these shortbread cookies and they are so crispy! Hi Emilie! Lovely site you have here and so glad to have found it. Your bundt is a masterpiece! Beautiful and delicious! 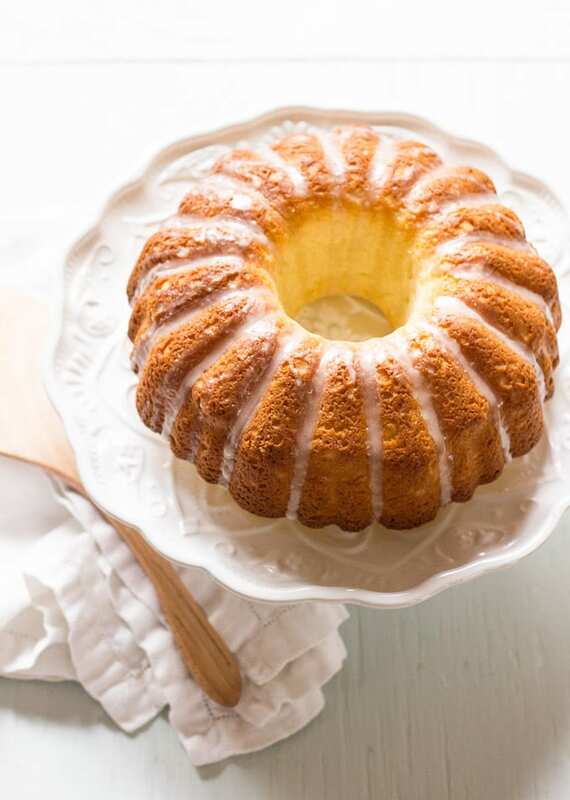 I can understand your apprehension regarding bundt… especially in a glass pan. I love bundt cakes, but rarely make them because they are huge! But I’ve realized if I freeze half, I can enjoy the splendor in a few weeks again! Thanks for the opportunity with MightyNest. I am not familiar with them, so this is a welcomed introduction! And thank you too, for this delightful, beautiful recipe! Welcome Traci! I love the name of your site ;) You know, I never thought to freeze half of the bundt cake- they really are huge! Or maybe we’re just pigs and consume the whole thing within 24 hours so the thought of actually saving some for a later date never crossed my mind. I think that’s it. And you are quite welcome with regards to the MightyNest. I only hook up with brands that I would personally buy from and they have some really great stuff. Everything you see here for the giveaway is pretty sweet (no pun). I hope you entered the contest! Good luck! What beautiful cake! And just in time for National Bundt Cake Day on November 15th. You are clever indeed. Great timing. I have always wanted one of those cake boxes. Maybe I will get lucky! Thanks also for the introduction to Mighty Nest. They have just the kind of products I love. I especially like their wide array of glass storage items. It’s great to know about them. I’d love to order a cakebox, where can i get one? 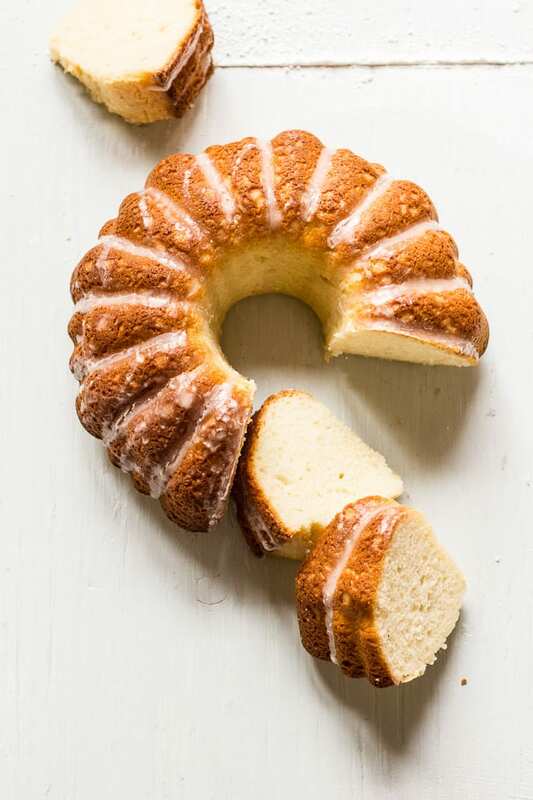 And also the the bundt pan I want one because it looks like you can properly portion the slices evenly. Both items are from MightyNest.com. Here’s the link to the bundt pan and cake box. A lovely bundt cake. Thanks so much for the recipe. , I’ve just discovered your site and have cooked two of your recipes in 3 days – both were very popular, keep them coming! This is gorgeous, and I am so impressed by the use of a glass bundt! I’ve never seen one before and am so intrigued! And I am with you on the whole “stress-baking” deal. Nothing better than cooking to clear your mind! Beautiful cake! I love french cruller’s so I can’t wait to try it. I also bake at 7500 feet, so I’m hoping for the best. Welcome Diane! Ooo, high altitude baking… I’ve always wondered about that. It is difficult to get used to? I’m sure with trial and error you’ve mastered it already. Good luck and enjoy the recipe! I love baking and experimenting with anything gluten free. Emilie, your cake is gorgeous! The lighting in these photos is so beautiful :). I love bundt cakes and just made an apple cake in a tube pan – they are great sizes for parties! This is lovely! And looks perfect for brunch or a tea party! This cake looks perfect. Do I use a 8″ or 12″ bundt pan? I have both , but definitely want a glass one like yours!! Another bundt virgin here (I presume cutting out the uncooked middle of a sunken cake doesn’t count). I must admit that reading this has made me wonder why I don’t try it as yours looks fab. Ha ha… that’s really funny and quite clever of you Anne ;) Bundts are really not that scary, and since they don’t require much adornment on the finish I’m liking them a lot more! Low maintenance baking is my thing, clearly. Gorgeous cake, I really must get myself a bundt pan! What really got me was the name “French Cruller”, always my favorite doughnut to get from the Dunkin Doughnuts located right across the street from my dentist office, it was torture driving home after an appointment with a novocaine numb mouth or just after a flouride treatment unable to eat for what seemed an eternity, but eventually I’d get to bite into that yummy cruller, this cake of yours brings those delicious memories flooding back…yum. Oh my goodness that is torture! It’s almost as bad as having a location right next to the gym ;) I do love a French cruller donut myself, it’s so light and airy. This is more of a fluffy cake version but the glaze seals the deal for me. I’m glad my humble bundt was able to bring back memories… after the novocaine numb mouth of course! I have a bundt pan, but not a glass one – I have pan envy now. I hadn’t used mine until two weeks ago. I just made another last night. They are my new favorite! They look so elegant on the cake plate, and encourage less goopy frosting – we’ve done a sprinkle of powdered sugar and a glaze. Next time I will do a ganache! Hi there! Love the blog! This recipe looks incredible. I’m not much of a baker but this looks so good I must try! Pictures are simply stunning! Did you use natural light to photograph them? I’ve never seen such gorgeous light. Hi Donna! For all of my photos, I use natural light only. I photograph between 10am & 3pm depending on the season. I follow the light and play around with different angles until I like what I see. Experimenting with shadows is my favorite. Your cake looks light, fluffy and just delicious. Totally agree with you about using self raising flour. I just love your photpgraphy, i could just touch the cake. Pinned!!! Hello Chichi! Thank you! I’ve never really worked with self raising flour until my mother-in-law introduced me to it. She uses it often for baking. It lends such a nice, light texture to baked goods and is super convenient with the leavening agents built right in. There’s nothing worse than missing baking soda half way through a recipe! Thanks so much for your kind compliments and for pinning! Where can I get a glass bunt pan?? I got my bundt pan from the MightyNest. It’s fantastic- just coat with cooking spray and it won’t stick. Plus, you can watch the batter as it bakes. It comes in 2 sizes (see below). 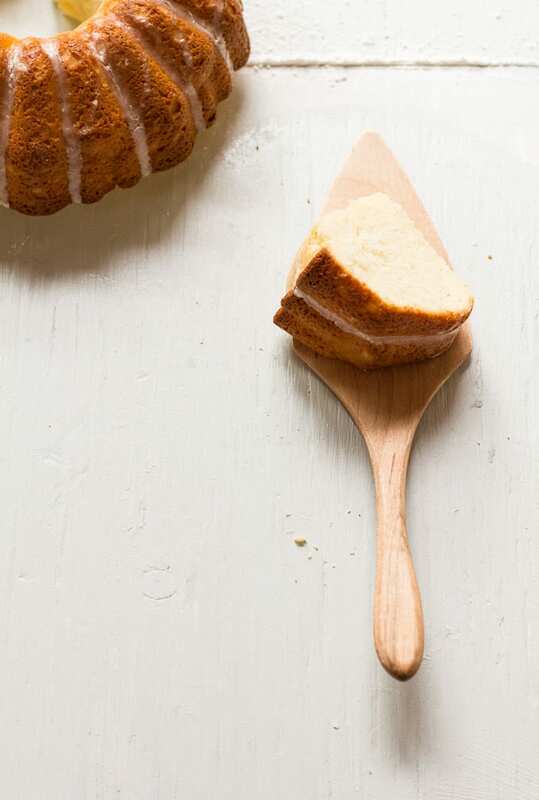 cross between a Chiffon and pound cake. In fact, better than a pound cake. Better than a Chiffon cake. Almost taste like a giant glazed cake donught. I bought like you Arthur Self Rising flour. Thanks! for 2 cups of flour ask for 3-4 eggs. I may try myself and will let you know. Thanks!!! Sure, go ahead and experiment with more eggs if you’d like! Let me know how it comes out. In my experience, a cake that’s too crumbly or has a coarse texture has been slightly over mixed. You might want to keep that in mind too! Hi Emilie. I bake all the time so it is rare for me to overbeat a batter. From experience, and of course assuming everything else was done properly (like not overbeating batter), an additional egg can make a big difference. I did make it with additional egg and it does make a difference. Cake is even softer and less crumbly. I love your cake but after my coworker told me it was a tiny bit crumbly, I decided to experiment. LOL. Do give it a try. Regardless though, your cake is delightful. Just made this cake to bring to work and i don’t know how i will wait till tomorrow to taste it! Thanks for sharing an awesome idea! I made it just as instructed. Delicious! I wouldn’t change a thing. Thank you for such a wonderful recipe. Love. Bundt. Cakes. Simple and easy. A. ONE. PAN. AND LOOKS. ABSOLUTELY. FANTASTIC. I’LL. BE. MAKING MINE TONIGHT. THIS. RECIPE. LOOKS. LIKE. CREAM PUFF.U. BAKING GIVESUU DOUGH JUST NOT. COOKED ON STOVE. I AM WITH YOU. BAKING. IS A STRESS RELEIF LOOKING FORWARD TO THE CAKE. YUMMMY!!! !